Home » Posts » Blogs » Who Was Ferdinand Monoyer? You may have noticed that Google recently paid tribute to the Ophthalmologist Ferdinand Monoyer in their ‘Google Doodle’ (you can find it here), and the story was widely picked up in the press for days afterwards. This was great to see, and actually long overdue. While most people will never have heard of Ferdinand Monoyer, his legacy and inventions live on into modern-day medicine. It is no under-statement to say that his work has saved the sight of millions of people, and improved the lives of countless others. Born in 1836, he was a Frenchman who become an ophthalmologist and went on to teach at three prominent universities in Lyon, Strasbourg, and Nancy. In 1872, he developed the dioptre – the unit of measurement used for lenses and vision. He also created the Monoyer Chart, an eye test that measures how well the retina focuses. Although, this has now largely been replaced by the Snellen Chart, much of the features remain the same. Basically, if you have ever had an eye examination, Ferdinand Monoyer is the man you should thank! Why Does a Dioptre Matter? For those of you that regularly have your eyes tested, you will have noticed that your vision is assessed by + and – values. 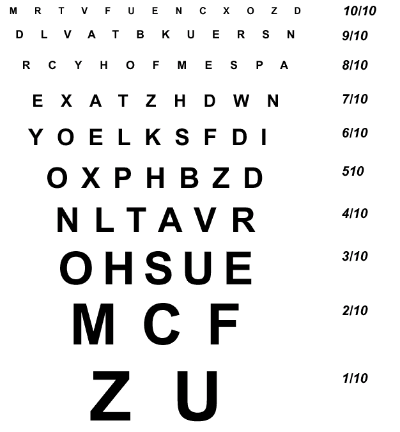 These are known as dioptre measurements and are the numbers that are written on your eye prescription. A positive number indicates that a person is far-sighted. When you refer to you own vision in numbers, then you are referring to the number of dioptres your lenses have. Over 140 years after it was first developed, it is still used each day in every country in the World. Unlike the dioptre, this is a basic examination of visual clarity. It is a simple chart with multiple lines and letters that vary in size (larger letters at the bottom, smaller letters at the top). The person undergoing the examination is instructed to cover one eye and read the chart from 6 metres away. They stop reading when they reach their visual limit, and their eyesight is estimated. In Ferdinand Monoyer’s day, the ability to read all of the chart was know as having 10/10 vision. Since the switch to the Snellen, and now the LogMAR chart, the value of 20/20 vision is used instead. However, much of the chart’s influence, design, and effectiveness can be traced back to Ferdinand Monoyer. He made sure he was remembered! When devising the Monoyer chart, he included his name into the design. Look closely and you will see that his first name rises upwards on the right hand side, while his last name is on the left. He was born in the Alsace region, which nestles on the border between France and Germany. His step-father was also a respected ophthalmologist called Victor Stoeber. It is now possible to visit the house where he lived in Lyon. Special events are held where the public can attend.